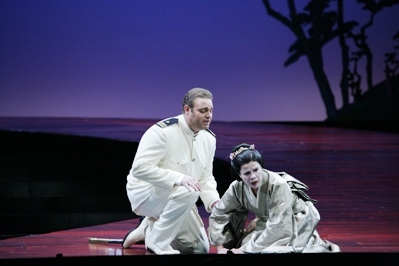 Let’s forget, for just a second, about the performances in Houston Grand Opera’s new production of Madame Butterfly. We’ll come to those. The reason to see Madame Butterfly, an opera done so often by so many people that’s its managed to almost rend itself immune to either surprise or criticism (I mean, you don’t pan The Nutcracker, you know? Ditto with Butterfly), isn’t just the performances. It’s because it’s positively gorgeous. “There were a bunch of moments during the final dress when people literally just went, whoa,” MEGAN, HGO’s director of props, mimics an exaggerated exhale. She should know. She’s part of an army of behind-the-scenes people audiences don’t necessarily consider, who helped bring the vision of Tony Award-winning team of director Michael Grandage, set and costume designer Christopher Oran and lighting designer Neil Austin (who took home awards for this season’s Red on Broadway, among many others) to life. MEGAN is responsible for finding – or making – all the props that show up on stage. Which means, basically, that whenever you look at something that someone picks up or uses, MEGAN had her hand in it. 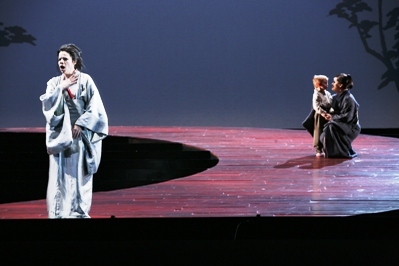 The countless cherry blossoms that litter the stage between acts II and III come under her umbrella. To “twizzle” is to take the endless amounts of tissue paper cherry blossoms and give them a little lift, by gently ruffling them. MEGAN and her associate Andrew Cloud, along with the hundreds of open house goers, contributed to the process. You won’t fully appreciate what this means until you see them strewn about the stage – Butterfly’s magnificent expression of love in anticipation of Pinkerton’s return. And if the props are wonderful in their details (pay attention to the handmade boat in Act III; Cloud made numerous versions of it before the one you see on stage was selected, which makes for a lovely little scene by itself), the costumes are something quite beyond stunning. Remember that this is a brand-new production of Butterfly, which means that everything you see on stage is, well, new. No one went to storage and took out the set. No one opened the wardrobe and dusted off those kimonos. HGO’s team of craftsmen created them – from scratch. If her tone sounds slightly awed, consider that the costumes for all the women – and some of the men – consist of multi-layered and multi-part silk kimonos, robes and accessories – all of them constructed from scratch. Morales estimates that between the pattern making, dyeing of fabric and sewing the costumes, the crew has been working on Butterfly for nearly five months. Which brings us, conveniently enough, to the Butterfly you see on stage. Through and through, this is Cio-Cio San’s show, and Martinez owns every minute of it, from her initial, naïve acceptance of being Pinkerton’s “comfort bride,” to her ultimate, doomed sacrifice of her very self for love. With lush and longing legatos that pack a million emotions, Martinez, in her role debut, proves that she’s not only a hometown favorite (Martinez is a former member of HGO’s acclaimed Studio program), but a world-class singer. She’s steadfast in her loyalty, unwavering in her belief in love, and the power and seduction in her gorgeous soprano pull the audience into Cio-Cio San’s story. As the feckless Pinkerton, Joseph Calleja sings with rich warmth, even as he plays the cad. He has the misfortune to be the bad guy here, the American who inevitably leaves his Japanese child-bride for his American life, but his joy at being in Japan, and his conflict over his conundrum with Butterfly are real. Lucy Shaufer’s Suzuki is steadfast and strong, while Levi Hernandez, as Sharpless, brings a moral commentary much like a Greek chorus to the tragic love affair unfolding on stage. Patrick Summers and the HGO Orchestra turn in a stunning performance, gloriously evoking Puccini’s every sigh and cry, every exclamation and exhaultation. To see this Butterfly is to immediately put yourself in the hands of something familiar and something utterly new. With a minimalist set that offers just wisps of a Japan newly opened to the West, it never fails to surprise, and the transition from Act II to Act III is especially sigh-inducing. This is a Butterlfy that is sure of itself, even as it offers new looks at an old favorite. And it’s a production so worthy of excitement, there’s little wonder HGO added a performance on Nov. 11.